Characteristically in dry open sandy ground, including savannas of oak, aspen, and/or jack pine; clearings, rock outcrops, banks, prairie remnants, shores; fields, roadsides, railroads; sometimes in wet places. 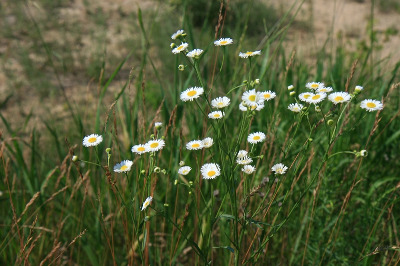 Considered indigenous in North America, but weedy in habit and an introduced weed in Europe. Usually a shorter, more slender plant than E. annuus, up to 5 (–8) dm tall. Rarely (in Michigan) plants with essentially entire, narrow, oblanceolate leaves as in E. strigosus may have the long spreading stem hairs of E. annuus. They presumably represent what has been called E. strigosus var. septentrionalis (Fernald & Wiegand) Fernald, but we have associated those plants here with E. annuus. Very rarely the rays are much reduced or absent [f. discoideus (A. Gray) Fernald]. Such plants have been collected in Keweenaw and Lenawee Cos.
MICHIGAN FLORA ONLINE. A. A. Reznicek, E. G. Voss, & B. S. Walters. February 2011. University of Michigan. Web. 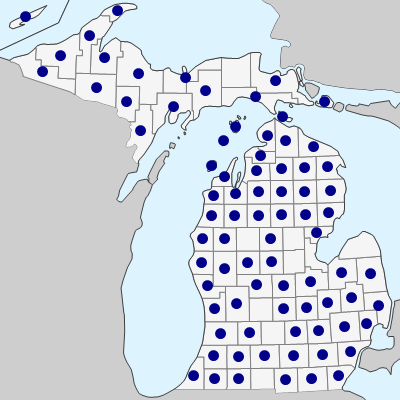 April 21, 2019. https://michiganflora.net/species.aspx?id=320.